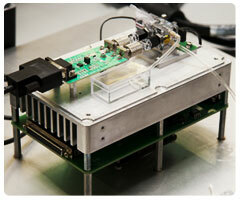 Electronic BioSciences (EBS) develops state-of-the-art instrumentation for research and sensing applications. Our technology is centered on the measurement of electrical current through biological and inorganic nanopores. By combining extremely low capacitance nanopore platforms with advanced low noise electronics, we have designed easy-to-use instrumentation for high fidelity measurements of electrical current through ion channels and other nanopores. Much of our focus is on the reduction of measurement noise. We do this by bringing together two important capabilities: low noise electronics design and novel nanopore platforms. While excellent off-the-shelf electronics exist for the precise measurement of very small currents, we design all of our sensing electronics in house in order to achieve the best possible performance. Our scientists and engineers have many years of experience designing low noise electric and magnetic field sensing systems and have applied these unique skills to the particular needs of EBS. For the ideal nanopore platform, we work closely with our collaborators at the University of Utah who invented the glass nanopore membrane (GNM). Building on their initial developments, we have optimized the process for nanopore fabrication and integrated the device into specially designed systems. By working across all levels of the technology, we are able to produce systems with state-of-the-art sensitivity and performance.